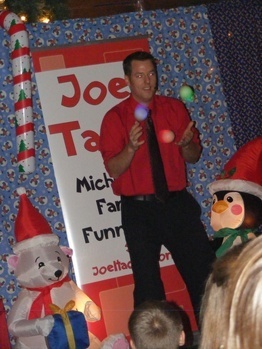 Juggler Joel has performed for hundreds of thousands of kids, teens, and families at libraries, schools, festivals, and special events since 1995. 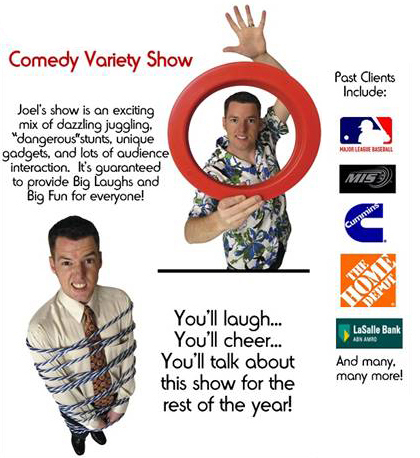 Your group will love Joel’s fun shows that guarantee BIG laughs and BIG fun for everyone! These interactive shows are the perfect way for your group to celebrate anytime of the year! Joel’s Variety Show is a HUGE hit with family audiences everywhere! 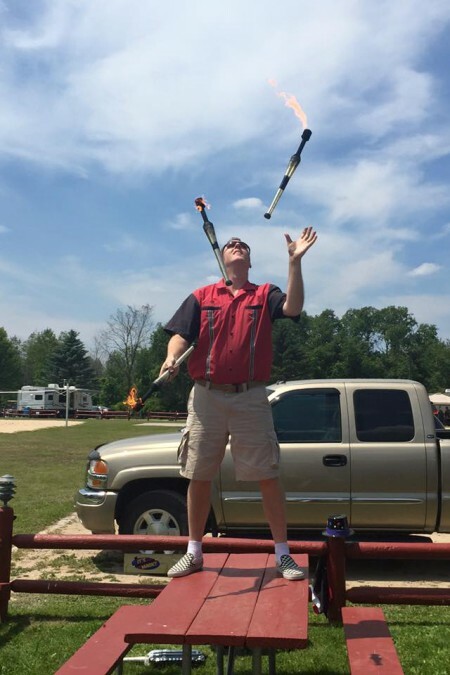 Dazzling juggling, amazing magic, goofy stunts, wacky music, and LOTS of audience participation highlight this exciting show. This interactive show is 45 minutes long and comes complete with a professional sound system, colorful backdrops, and all necessary equipment. 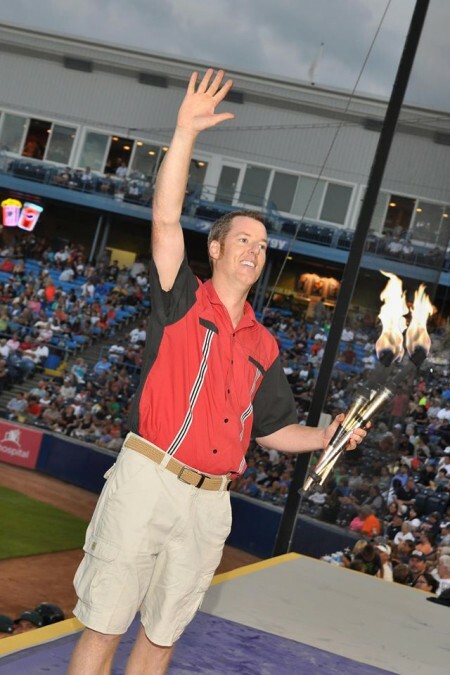 Joel’s lively performance can fill an entire stage or fit into the smallest corner; either way, Joel will put on an amazing performance that your group will love! The Character Show is an exciting assembly to help your group build good character! Joel plays good, bad, and silly characters as he shares memorable lessons about being Trustworthy, Fair, Responsible, Respectful, Caring, and Good Citizens. Comedy, magic, storytelling, and more draw students into the performance by volunteering & cheering as they learn to how to make a difference! 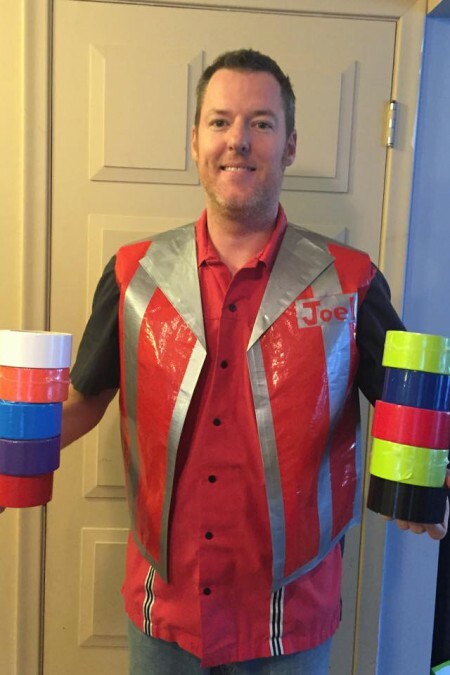 Help kids & grown-ups celebrate Halloween with Joel’s Spooktacular Comedy Show. You’ll watch Silly Scientist Joel juggle eyeballs, get mixed up with Multiplying Bottles, and be shocked by an Animated Frankenstein Drawing, in this HEADSPINNING display of Holloween hootenanny! You’ll even be illuminated by Joel’s Far-Out Flashlight where he encourages Halloween safety. Magical Halloween adventures await, in this exciting-not-scary show that will have your group celebrating the spirit of the season! With Joel’s Wacky Winter Comedy Show you’ll live the adventure of a magical Snow-Day as you see some Silly Snowballs, discover a Mischevious Sled, taste some Multiplying Candy Canes, warm up with an Endless Cup of Hot Chocolate, and more. You’ll even be serenaded by Scott the Singing Snowman! Joel’s Let It Snow Santa Show celebrates Santa and his crew, gifts & trees too! Hear an amazing Musical Christmas Tree, taste Multiplying Candy Canes, and sing along with an Animated Santa Drawing! Even the North Pole makes an Appearance during this exciting show that will have your group celebrating the Christmas Season! With The Super-Caper Reading Show, your group will FLY, POW, and LEAP into Reading with Super Joel! This exciting 45 minute performance brings 7 SUPER-DUPER books to life using amazing magic, hilarious stunts, and lots of audience participation. Plus, Super Joel highlights lots of super reasons and fun ways to read anytime, anywhere. This fun performance is perfect for anytime of the year including kicking-off, re-energizing, or wrapping-up your “March Reading Month” festivities. Calling all Super Readers! Joel did pretty good job overall. The crowd enjoyed his performance at the half. Absolutely perfect for our family audience. I am a great fan of your jokes and magic. You are amazing and I would like very much to compliment you. Jake F., actual email from audience member and fan. Your program was entertainment and educational. What a great combination! Just wanted to take a moment to thank you for making the duct tape workshop a very successful event for our library. I know the kids (of all ages) had a great time. Thanks! Funny…a big hit! The students loved being involved…Joel gets an A+ from our staff! Absolutely perfect for our family audiences. Lively, enthusiastic, and very entertaining.